When you want all of your canine amputation recovery and health questions answered fast, this Tripawds Library Bonus Package gives you a complete education about life on three legs. Purchase your download below to start studying in minutes or read on for complete details about what’s included in this special offer. Tripawds E-books: Buy Two and Save! Whether your dog is facing limb amputation because of illness or accident, you are thinking about adopting a fully-grown canine amputee, or you just want to keep your current three legged dog healthy and strong, this Tripawds Library Bonus Package is for you! 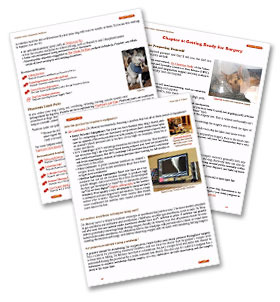 Featuring both Three Legs & a Spare and Loving Life on Three Legs, this indispensable resource is packed with more than 225 pages of helpful information for your amputee dog education. When coping with an amputation for your dog, you need answers, and you need them fast. Three Legs & a Spare will help you prepare for your best friend’s new life on three legs. 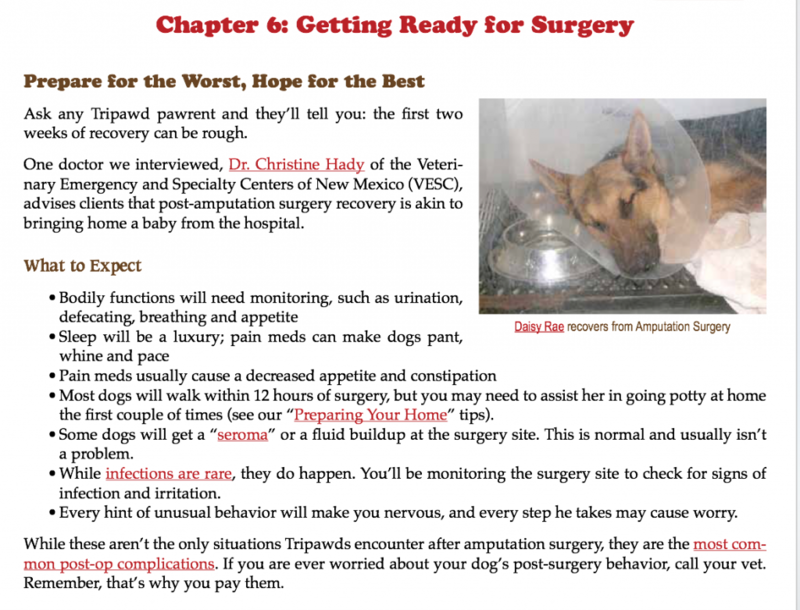 Three Legs & a Spare: A Canine Amputation Handbook features the best tips and advice from more than six years of compiling Tripawds community resources about canine amputees. This 110-page interactive PDF contains the best advice from more than 5,500 Tripawds community members. With hundreds of informative links, Three Legs & a Spare will save you time and provide immediate answers to your questions. Nearly six years in the making, Loving Life on Three Legs: Canine Fitness and Conditioning for Happy, Healthy Tripawds is the second e-book in the Tripawds Library Bonus Package. 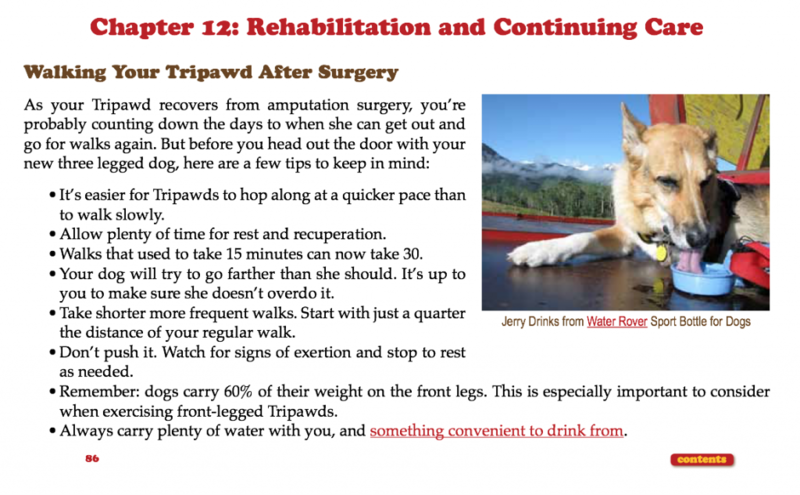 This second phase of your Tripawds education is all about maintaining good health and fitness for canine amputees. 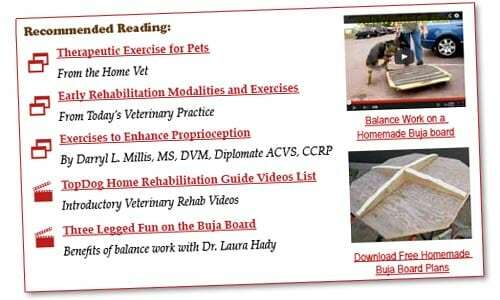 Help your dog live a long happy life with information from veterinarians and certified vet rehab therapists, along with hundreds of direct links to articles, forum topics, interviews and how-to videos for exercises you can do at home. 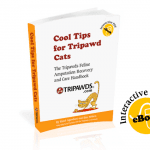 Each e-book includes hundreds of direct links to the most informative Tripawds blog posts, forum topics, interviews and how-to videos. This Tripawds Library bonus offer combines both books in one document you can read offline! Save on fun Tripawds Stuff Too! Tim, I am really sorry to hear about your pup. You are in the right place for help, you are surrounded by others who understand what you are going through and ready to support you during this journey. Please visit our Discussion Forums and Chat room and download our ebook for answers to all of your questions. We would love to hear all about your very special pup so stop by the forums OK? Many hugs to you both. Sorry to hear about your lab Russell, but you’ve come to the right place! These e-books quickly address the most common recovery and care concerns. Bookmark Jerry’s Reading List and post in the forums for more help and support from members. Hi – our chocolate lab recently had her front leg amputated (4 days ago). Sometime she yelps hysterically for a few minutes at a time and we are at a loss as to what to do the comfort her. Our hearts break each time. It seems to pass but she stays awake panting and obviously in pain and distress all night. Will this end soon? What can we do? The symptoms you describe may indicate phantom limb pain. Heavy panting is also a common side effect of many pain meds, especially Tramadol. 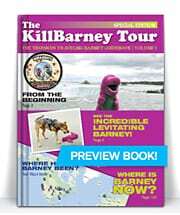 We cover both topics in great detail in the first e-book. Do you know if I can buy hard copies of the Dr. Dresslers books without the other E-book stuff (I live in the dark ages.) I have looked and looked. I like hard copy books too Tracy! Try this link in our Amazon Blog. The anticipation of amputation is SO scary! I went through this with my angel of a pup. No one could figure out what was wrong w/her and amputation was the very last resort. I am happy to report that it has been almost 2 years and she was back to her old self w/in about 48 hours of the operation. She is sweeter and happier than she was before. Rest assured the process is harder on us than it is on them! Ohhh it’s so nice to hear Ripple is doing great! It’s been a long time! We would love to feature her for Tripawd Tuesday, be sure to send us your story.